This weekend the "super bowl" of competitive eating will delight and/or repulse Coney Island visitors for the 94th consecutive year. 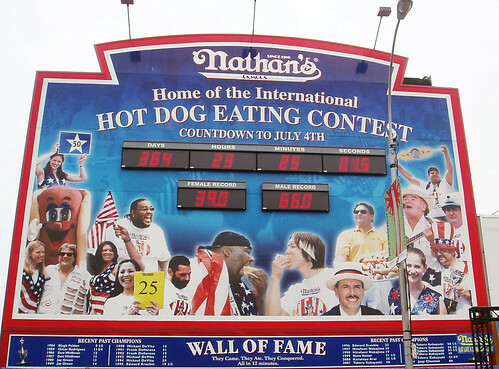 In fact, last year in front of nearly 40,000 on-site spectators, Nathan's got some extra mileage as the annual Nathan's hot dog eating competition went into a 5 dog "OT" for the first time in the event's history. In 1997, two brothers, Richard and George Shea formed the International Federation of Competitive Eating (IFOCE) to govern competitive eating competitions throughout the world, including the Coney Island contest. ESPN has helped take the event's awareness, and that of its title sponsor, to new heights since the event was first aired in 2004. Nearly two million households watched the event last year and three full hours of coverage are planned for the ESPN network of families this year. According to Shea, Nathan’s got $100 million of media last year with $40 million coming from domestic TV alone last year. How does this compare to "traditional sports?" Nathan's should know. They recently signed two 10-year deals with New York's newest sports institutions - the new Yankee stadium and Citi Field. The MLE also has coverage of events on Spike TV and Fox Sports. Aside from media, the MLE has proved to be a maestro at drumming up new PR opportunities for their partners. The July 4th event now has qualifier competitons at locations like Citi Field leading up to the event, is expanding to Asia, has introduced a "bunnettes" beauty competition and boast an array of colorful personalities (pro athletes?) like Kobeyashi, last year's champion Joey Chestnut and Eric "Badlands" Booker. The competition is not without controversy. NY1 news reporter Adam Balkin reviewed taped footage of the 1999 contest and noticed that Steve Keiner ate half of a hot dog before the contest had officially begun, which would have resulted in disqualification. Oh - and there are those who are concerned with the potential health hazard that the mass food consumption conveys. Other MLE licensors and sponsors include brands like Krystal (Krystal Square Off Hamburger Eating Championship), Pizza Hut (Pizza Hut "P-Zone" Chow-lenge), Ben and Jerry's (Ben & Jerrys' VERMONSTER Eating Contest), Heniz (official ketchup), Nintendo (Major League Eating The Game). However, the question remains, as the media component grows will non-endemic sponsors ever have the stomach for Major League Eating? "At a time when brands are pulling back on their media spending, Major League Eating is a wise choice and super viral," MLE president Richard Shea recently told Darren Rovell. "From an ROI perspective, Major League Eating trumps pretty much every other niche or extreme sport."